Sometimes, life’s unintended results are the most enjoyable. Such is the case for anglers fishing the network of manmade waterways cut through the Southern Louisiana marshes. Decades ago, the drilling industry dug a vast network of navigable channels to allow access to a smattering of wellheads, pumping stations and other structures. During winter, these deep, muddy waterways offer essential warmth for redfish struggling to survive the chilly months. In places such as Galiano, Golden Meadow, Leeville and Venice, inviting expanses of swaying grass, storm-blown trees and labyrinthine creeks are Louisiana’s answer to Florida’s Everglades. This habitat collectively called “the marsh” is a massive food production facility with a host of ambient accents ranging from roseate spoonbills and white pelicans, to alligators, otters and nutria. Golden Meadow guide Troy Robichaux said the canal system’s major selling point for redfish is depth – an attribute with seasonal significance. 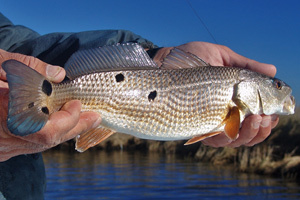 A steady redfish bite exists year-round, but canals are especially popular in winter, when fish seek stable temperatures in the 8- to 10-foot depths of these dredged ditches. “Canals are the deepest spots in the marsh,” Robichaux notes. “Saltwater fish can’t tolerate much cold weather, so when the tide drops off in cold times, canals give redfish and trout a safe zone. Marty Duet, who also guides local marshes, said that the privately-owned canals see far less boat traffic than public areas like nearby Catfish Lake or the barrier islands. This semi-seclusion, plus abundant forage bodes well for reds. Moreover, he said, constant coastal erosion means the outer mash and barrier island habitat sees increasing saltwater intrusion. This pushes more redfish toward the inner marsh and the pipeline canal environment. Here, the fish find cozy digs with no reason to leave until they reach offshore spawning age. Canals, with their higher edges, also provide a water-smoothing wind break. Anglers just ease along the edges with the trolling motor and watch the bottom machine for humps, points and any submerged structure that can help redfish corral their meals. Oyster shells along the banks – often visible at low tide – always indicate promising water. Reds find loads of crustaceans and invertebrates around these shells, so work a broad pattern along the shoreline and from shallow-to-deep water until you find the sweet spot. Tidal flats draining into a passing canal represent good high-water spots. Low tide reveals each area’s fish-attracting features, such as depressions, stumps, and oyster colonies. Egrets clustered along shorelines indicate the presence of baitfish. On a falling tide, target the cuts connecting shallow runs to pipeline canals. Sitting on one of the points enables you to pick off fish exiting with the tide, as well as those ambushing baitfish on the outer corners. Quarter-ounce jigs with grub, shad or tube tails in darker colors like avocado, watermelon, pumpkinseed and root beer work best in the cold season. Gold spoons are also a good bet for covering water to find active fish, while artificial shrimp like the DOA and Gulp baits are usually an easy sell to hungry redfish.